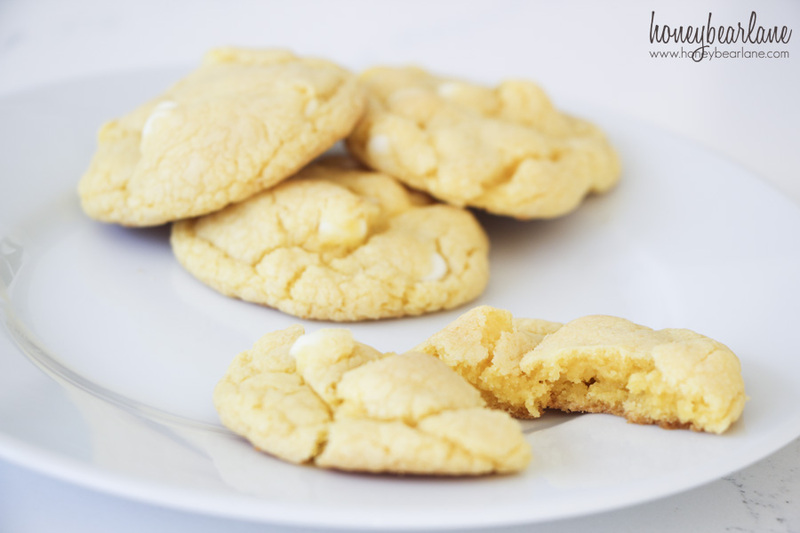 That’s kind of a mouthful– cake mix white chocolate lemon cookies! And what a delicious mouthful it is. I am super duper addicted to these and literally can’t stop eating them. We had a family dinner tonight and I was in charge of dessert. I wanted to make something fast and easy and these are as easy as a mix. Well technically they are a mix, but a mix you just might already have in your pantry…cake mix! And if you don’t, stock up when they are on sale and get every flavor because you never know when you are going to use it! I especially love to get chocolate and lemon because there are so many yummy desserts you can do with those two flavors. In this case, you will need lemon cake mix. 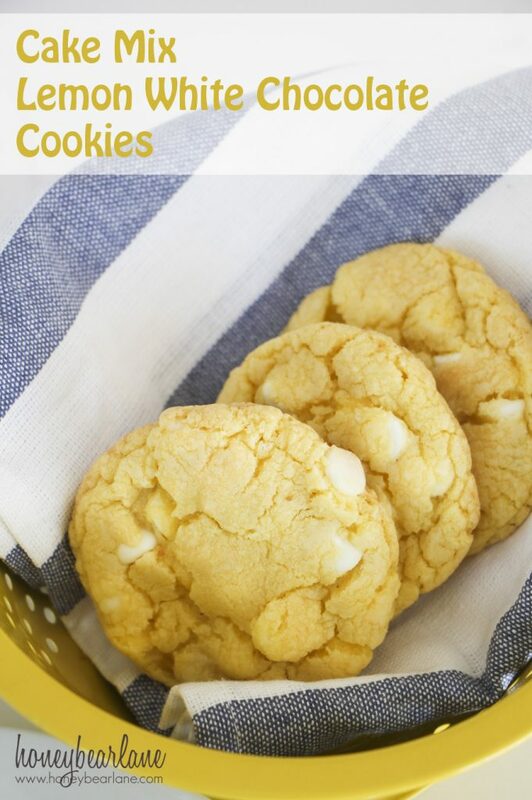 You will also need a stick of butter, an egg, vanilla extract, lemon extract (not totally necessary but it adds a little extra lemony flavor) and white chocolate chips. Preheat the oven to 375 degrees. Melt the butter in the microwave and then mix the butter, cake mix, egg, vanilla, and lemon extract until it forms a thick dough, kind of like the consistency of play dough. Then hand mix in the white chocolate chips until evenly distributed. Form the dough into small 1 inch balls and place on a cookie sheet. Bake for about 8 minutes and check to see how they are. They should be spread out a little but not browned. If they are getting browned, they are too done. 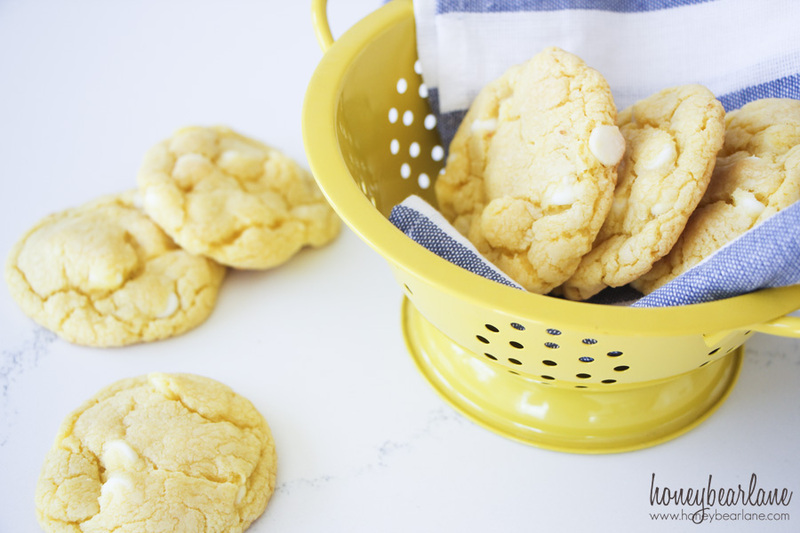 Take them off the cookie sheet onto a cooling rack and enjoy! Mix all ingredients except chocolate chips together until well combined and the consistency of play dough. Hand mix in the chocolate chips. Form small 1 inch balls and place on a cookie sheet. Bake in a 375 degree oven for about 8 minutes, until they spread out but are not browned. Cool on a wire rack.